May is almost over and you know what that means; the Dearborn Memorial Day Parade is almost here! This year is Dearborn’s 89th Memorial Day Parade and is the longest running Memorial Day Parade in Michigan. For years, the Dearborn Historical Museum has taken part in this Dearborn tradition by driving the Model Ts down Michigan Avenue and waving to all the celebrating Dearbornites. And this year is going to be no different! To make this happen means putting in some extra work. 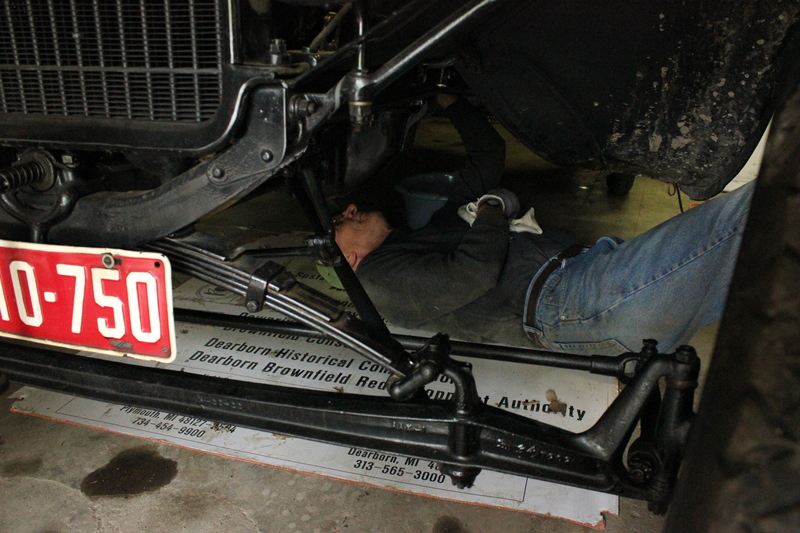 Keeping the museum’s Model Ts safe, means not driving them around needlessly in our unpredictable Michigan weather. But as anyone with a car can tell you, letting the car sit for too long can cause all sorts of problems. That’s where our intrepid volunteer Tom Saroglia comes in. 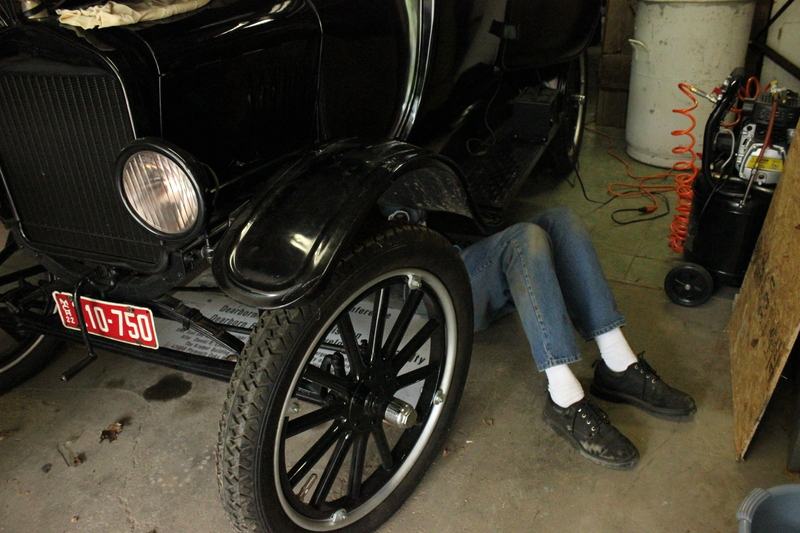 Tom’s job today is performing general maintenance on the museum’s Model Ts and get them in tip-top performance for the parade. The most important job he will do today is changing out the old gas already in the engines with new gas. The problem with old gas is that it gets thick and gunky. This is caused by oxidation– air gets into the fuel and changes the nature of the gas. This gunk can block up the fuel lines, the carburetor, filters, anywhere the gas travels there is a potential for blockage. Old gas can not only cause a car to run poorly, but can stop it altogether if left untreated. Thank goodness Tom is here to make sure this doesn’t happen! With Tom’s help and volunteers like him, it’s our hope here at the Dearborn Historical Museum that our Model Ts will run forever so that we can take part in the great Dearborn tradition: the Memorial Day Parade! In addition to our monthly behind the scenes blogs, the museum is also introducing “What is it?” posts. These posts will explore items from the museum’s collections; artifacts that are unusual or are things that people just don’t use any more. Can you figure out what these mysterious items were used for? Here’s the first one, GOOD LUCK! 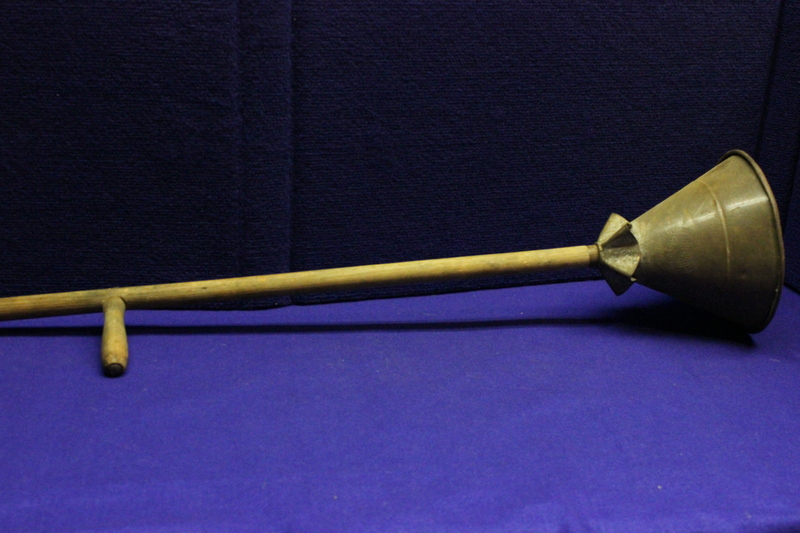 This item has a wooden handle that is about 35″ long with a metal cone attached at its base. On the wooden handle, there is a hand rest about a foot from the top that sticks out perpendicular and is about 4 1/2″ long. The metal cone is stamped with a maker’s mark, is 7 1/2″ long and has a diameter of 8 1/2″. The inside of the metal cone is separated by other metal pieces that have holes drilled into them. All together, the item is a little over three feet tall and is fairly light. Hint: the metal is rusted.